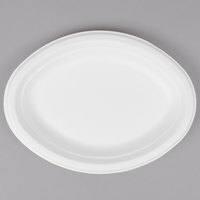 Serve appetizers, entrees, and desserts to guests on an oval eco-friendly platter. Unlike single-use plastics, these platters are made from sustainably sourced materials you can feel good about using. This makes them an ideal addition to your concession stand, catered event, or deli. Also make sure to check out other great items from EcoChoice. We offer eco-friendly oval platters made from environmentally friendly alternatives to plastic that will still hold up against wet or heavy foods. 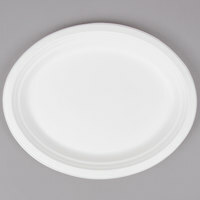 And because they're microwavable, these platters can be used to heat food up in your employee breakroom as well. If you’re looking to incorporate more environmentally friendly products into your commercial kitchen, consider swapping out traditional plates with these eco-friendly oval platters. Stay fully stocked with other disposable essentials including paper napkins, deli containers, and aluminum foil sheets. If you're wondering where to buy oval eco-friendly platters, we have a large selection of oval eco-friendly platters for sale at the lowest prices.